You will never have perfect data. It’s a sad but inevitable truth. Rare enough are the cases where can find the data you need for your project let alone data without a variety of errors that could compromise its quality. The silver lining is that you probably don’t need perfect data to begin with. As long as you can effectively measure and test the quality of what you do have, you can develop an understanding of your data’s limitations and develop new and creative ways to address them. I often hear people talk about measuring the ‘accuracy’ and ‘completeness’ of their data, and while these are certainly important concepts, I wanted to go beyond that to discuss some of the other aspects of data quality that I think are equally important. After all, what does it mean for your data to be accurate and complete if it isn’t available until after you’ve made a decision you needed it for? So, let me summarize the six measures I consider for data quality - Accuracy, Completeness, Integrity, Precision, Validity and Timeliness - and share some thoughts on how to test for them in practice. Data is accurate when it can be verified against an accepted version of the truth, a trusted authoritative source. Without an external validation source, it is very difficult to prove your data is accurate. Data can be inaccurate at capture or become inaccurate due to corruption over time. An example of inaccurate data at capture would be if my address was captured as 132 Rand Street when I actually lived at 123 Rand Street. Both are valid addresses, but only one is my actual home. Over time I might move home, but not have my new address updated in my records. Find an external trusted data source to validate against, if one is not available, find a proxy that you can compare against. For example, you might not be able to compare individual transactions against another source, but maybe you can compare them to the aggregate total or end of day values. Data is complete when each entity is counted exactly once. This means that you’re not missing any records or columns in the data that you need, and that you don’t have any extra records or values either. Nothing is being under or over reported. Completeness issues often occur when data are transmitted between systems and records are either sent more than once or are missed altogether. In some cases, data is filtered before being shared with another system and so unknowingly, records are lost. When testing for completeness you will first need to decide on the things you are trying to measure. This might sound obvious, but consider the case when a customer signs up for an account on your website. If they sign up 5 times, how many records will you hold for that customer? What if they signed up using different email addresses? You will need to think about whether to consider them as individual accounts or as a single person. If you have a unique ID or reference key, check if you have more than one record for that key to identify duplicate values. If you have an external source of truth, reconcile your ID/reference key against that source to identify missing values or extra ones. If you have a checksum or control total, confirm that your dataset has that many records or computes to the same checksum. For column completeness, identify which columns should not be missing values and analyze any records that are missing data in those columns. If you don’t have a reference number, consider other things you could use as a proxy to indicate if your data is over or under reported. For example, the volume of transactions per day, the aggregate value of transactions in a month or per user. If you don’t have a reference number, consider what combination of attributes you could use to identify duplicates in your data. For example, email address, physical address or phone number paired with a name or date of birth. For users to be able to leverage data across multiple systems and reports it's important that the data is recorded in a consistent manner so that comparisons are meaningful. 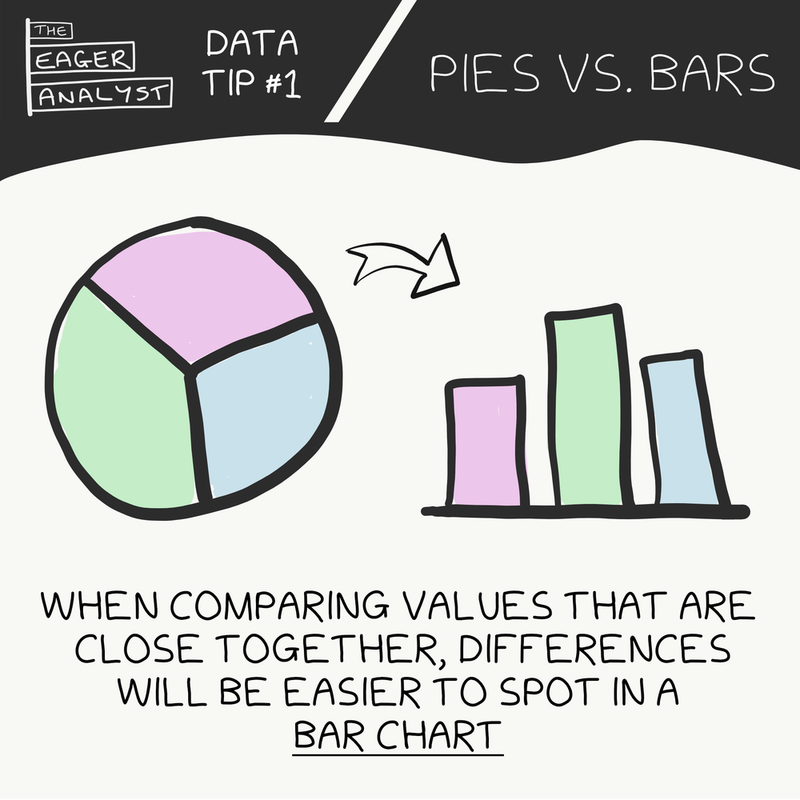 If two sources disagree on a particular value or calculate the same value in a different way, it can lead to inconsistencies in the data that make it hard to focus on bigger issues. Integrity is a big data risk when information flows between systems and could either be miscommunicated or become stale over time. Try to obtain a data dictionary for any data provided so that there is a clear explanation of what each column is expected to contain. Compare these definitions across sources. Where you have two sources, compare attributes between the sources to identify potential omissions or inaccuracies and define which you consider to be the authoritative source of that data. Concepts such as precision measure how granular a result is. Precision is an important concept to consider when considering the reliability of measurements in their greater context and should be communicated using units and a tolerance – for example, height being measured in meters +/- 1cm. Precision can lead to data quality risk if it is not maintained when flowing data between systems or there is a lack of clarity on the recorded precision (or the reasoning behind a particular level of precision). In low latency trading, for instance, decisions are made in milliseconds. If the time of a trade is recorded in seconds or minutes, the information shared would be meaningless for future decisions. Note that precision is not the same as accuracy; a result can be emphatically precise and completely inaccurate (for example, I can report my height as 47.239476 meters – very precise, and utterly false). Examine the values you have - do they cluster around specific values that may indicate they are being rounded to a less granular level? Be clear about the reasons why you have a particular level of precision for a recorded value. What level of precision do you need for your calculations? Validity measures whether a data attribute falls within certain predefined validation criteria. These rules typically reflect business requirements and can be valuable in stopping bad data from entering a system in the first place. For example, birth dates should [probably] never be in the future and a person’s weight should not be a negative number. If the data in our system don’t obey the rules we plan for them, they may break any information flows or systems that depend on that data. Where you’re expecting categorical values, check that your data falls within those categories. If you require certain fields to be present, check they are populated. For free text fields, analyze field lengths to look for instances where dummy data has been recorded. Timeliness measures how relevant the information provided is in the timeframe you’re using it. Information quality may deteriorate over time and become less meaningful. For example, a business may prepare accounts every month to provide a picture of the company’s finances. If they did this only on an annual basis, it may be harder for the company to make financial decisions come the end of the year. Depending on the type of decision or action being performed and the nature of the data, there may be risk if data is not being updated or provided in a timely manner. Look for expiration dates or last updated dates on key information fields. Things like contact information will inevitably change over time. Check when a report was last refreshed or prepared. Accuracy, Completeness, Integrity, Precision, Validity and Timeliness - These are my top six data quality considerations and concepts I routinely rely on to help test the quality of data I encounter. If your responsibilities include information management more generally, you may also want to consider things like privacy and security of your data. Let me know if you have any other things you watch out for when performing your analysis in the comments below, or on Twitter @eageranalyst. Little by little I've been continuing to share some of my top data tips on Instagram and even branched out from visualizations into agile and data prep. Now that I've got to number 10, it’s time for another recap. If you have any suggestions on topics or have your own tips to share, please let me know and I'll try to work them into the series. MISSING VALUES - Check your data for missing values before performing your analysis. CONSISTENT ORDERING - Be consistent when ordering. Either order by value, or by label. ASK YOURSELF - What are the numbers you’re not hearing about? 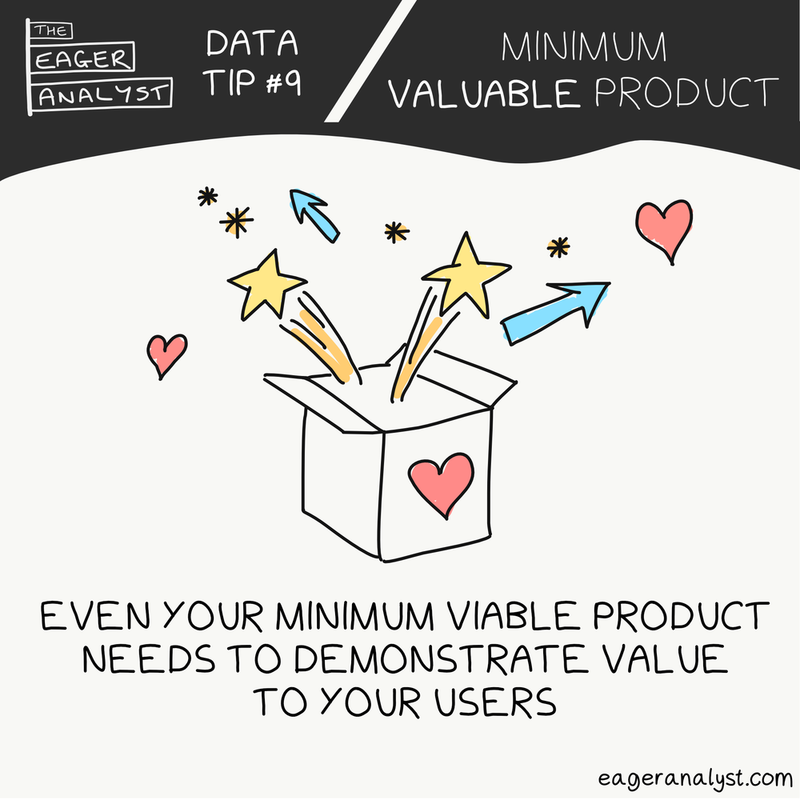 MINIMUM VALUABLE PRODUCT - Even your minimum viable product needs to demonstrate value to your users. HIGHLIGHT THE STORY - Use color and shade to highlight the story in the data. Provenance is an increasingly popular topic in the food industry as quality scandals and ethical sourcing of produce push their way to their way to the front pages of the press but have you considered how tracking the provenance of your data can add value to your data analytics? Is the meat you're eating from the animal you expected? Are your potatoes more travelled than touring rock stars? We don't just demand to know more about the source of our food either, as is exemplified by the volume of nutritional information provided with each ready meal packet. We want to know its makeup, the processes the food has undergone, and how that might impact our health. Without knowing the provenance of a product it would not be possible to manage the food supply chain so as to satisfy all of these informational labels - and given some of the latest scandals, some might say it still isn't managed well - but enough is recorded against each product to support the quality control process and provide customer information. With a productionized process, data provenance can be carefully considered, designed and implemented into a robust solution too. In the realm of data this can be seen in well defined feed specifications, warehouses with data dictionaries and reporting schema and dimensions that track versions such that a report can be run both in the moment and looking back through time. How do you explain the differences between versions to your clients, weeks after they were produced? The landscape of data warehousing and data lineage is well studied and defined but it can take years to get right. 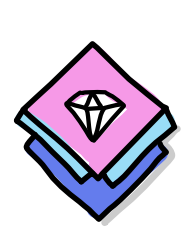 The W3C recently ratified a standard for provenance representation named PROV which builds on semantic RDF models to annotate entities, their relationships to other entity instances and agents http://www.w3.org/TR/prov-overview/. This encapsulates one of the latest forays into categorizing information across the boundaries of systems and organizations. But what happens when you’re not building a warehouse, but running an analytics team? And over the last few weeks you’ve extracted 50 copies of some dataset 20 different ways and are already on your 4th version of one of dozens of analyses you’re destined to produce? How do you keep track of each version? How do you explain the differences between versions to your clients, weeks after they were produced? It's certainly a challenge and something that I've come up against many times in my career. Particularly as many of these projects had an element of regulatory reporting for which a degree of rigor and auditability is required. The teams on such projects are often dynamic, in size, pace and the composition of team members and as the analytics team grows, it becomes ever harder to track analyses, business requirements and track how the two have evolved together. Guerilla Analytics is the field of research published by Enda Ridge and Edward Curry and something that I’ve written about before. However Enda has now published a companion book, Guerilla Analytics - A Practical Approach to Working With Data, and halfway through I’m already a convert to the mantra that provenance is everything. The book covers a number of data principles, risks and suggestions for managing them. However provenance sticks out as a simple keyword that can be used to help drive methodology and self-check that the approach undertaken is going to be a robust and reliable one. By placing emphasis on the organization and tagging of data, the book instills the values of Provenance. It's not enough simply to have a Provenance mantra, of course. The book promotes convention over configuration, outlining some ways in which these principles can be implemented while not relying on heavy documentation or industrial tooling and processes. For instance, aligning working papers and code with the development process, cataloguing data extracts, and versioning central repositories of data. These techniques don’t have to rely upon specialist technologies to support them either. File naming conventions and common work practices can go far in helping a team to track their data products. Now working In the field of Internal Audit, the buzzword is always ‘reproducibility’ and so provenance is aligned with my current world-view - if you understand where something has come from and how it has come to where it is now, you should have a pretty good idea of how to reproduce it. And if you know how to reproduce it, hopefully you have a starting point to understanding it too. Last week I had the good fortune to attend O’Reilly’s Strata conference where I heard from a number of leaders in the industry on how they were tackling both the technical and non-technical challenges of working with data. While listening to some of the talks I decided to try my hand at capturing some sketch-notes and I wanted to share these for others to see. I’ll add to this post over the next few weeks as I finish tidying-up my notes. The first sketch-note is for Brent Dykes (@analyticshero) talk Stories Beat Statistics where he shared the idea that by combining data and visuals with a narrative we can more successfully deliver key messages and influence change. 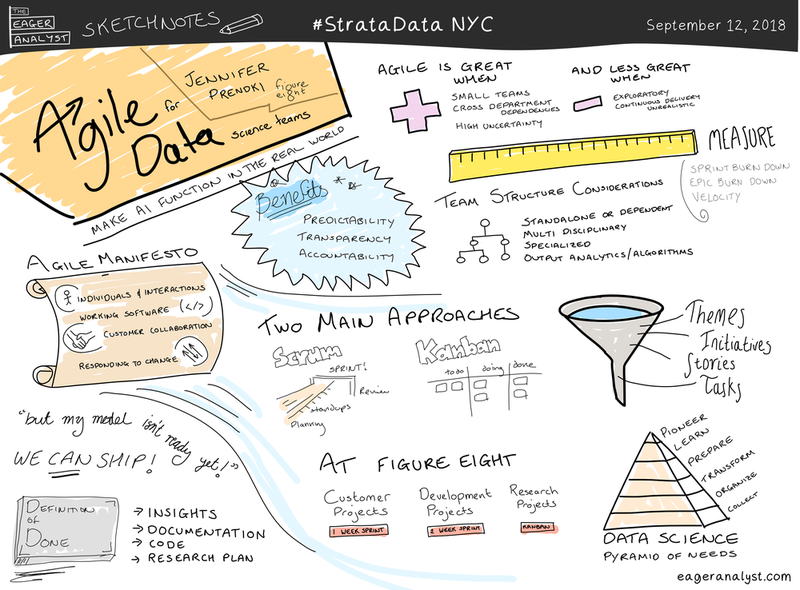 The second sketch-note is for Jennifer Prendki’s (@jlprendki) talk Agile for Data Science Teams where she talked about how Figure Eight were applying agile practices in their data science teams. It was super useful to hear how other data teams are using Sprint and Kanban for different types of projects. Last year, I was part of a team that invested heavily in making its application development pipeline ‘agile’ by adopting the Agile/Scrum methodology. We did this for a number of reasons, but one thing I noted while we were on that journey was the need for a pipeline of good, robust requirements. As our agile process matured, our requirements became hyper focussed on what the user benefits were and their measures of success. Where previously we had focussed on the components and technologies we had to build, the focus had switched to the incremental benefits we could bring to our users. The real success was that by incrementally developing features in line with the amount of user benefit that would be received, we could deliver those features to our users faster. Those new features were the ones our users wanted the most and when they started to battle test those features in the real world, our users had a raft of new, more important requirements we'd never even discussed before! Feedback that we might have had to wait months for before. Suddenly we were building the products our users needed rather than the ones they thought they wanted from the outset. We had gone from being solution based, to being user based. I spent less time prioritizing the components, technologies and integrations and more time discussing the user benefit of each incremental feature. Once the user benefits were clearly articulated, it suddenly became much easier for the team to prioritize the pipeline of work and, as the development team became more mature, the clean requirements allowed them to think creatively on how to develop solutions (it’s amazing how many different ways people can solve the same problem). Having concise, clear requirements helped the team to prioritize the right problems to solve and let the development team figure out how to best solve them. It also helped us to break large problems down into the elements that will deliver the most user value first. For example, if I implement a search feature across a particular dataset, the most basic story might be for that search to return results for an exact match, while fuzzy matching or stemming might come later. In the agile methodology, requirements are called stories and the definition of the requirements are called acceptance criteria. The story is easy to understand and clearly articulates the benefit to the user. The acceptance criteria are written like a set of observable test cases so that it's explicitly clear what the expected result would be for the user given a precondition and action. With the story and acceptance criteria documented, everyone on the development team should be able to understand what the benefit to the user is, and how to tell when the requirement has been met. As an analyst, I need to identify exceptions that match a search term, so that I can easily report on exceptions related to a particular topic. Getting a team to start documenting requirements this way can be a challenge and requires discipline, training and patience, but once the practice is in place it can provide a world of transparency into how projects are progressing, what requirements have been implemented and what's yet to be tackled. Breaking requirements down into discrete stories and implementing incremental value like this also allows development teams to get real production feedback from their users and respond to changing requirements in a way that would be difficult to achieve otherwise. Let me know if you're using agile techniques to build your data products, what's worked and what has proved challenging. Over the last couple of months, I've been sharing some of my top data visualization tips on Instagram. The principles have been written about a million times before, but it's oh so easy to slip up on the basics. Now that I've got to number 5, I decided to bring them together for your viewing pleasure. 3D CHARTS - Which portion is bigger, blue or red? 3D charts on a 2D medium make it very hard to tell. LEFT ALIGN TEXT - People are used to reading left-aligned text. 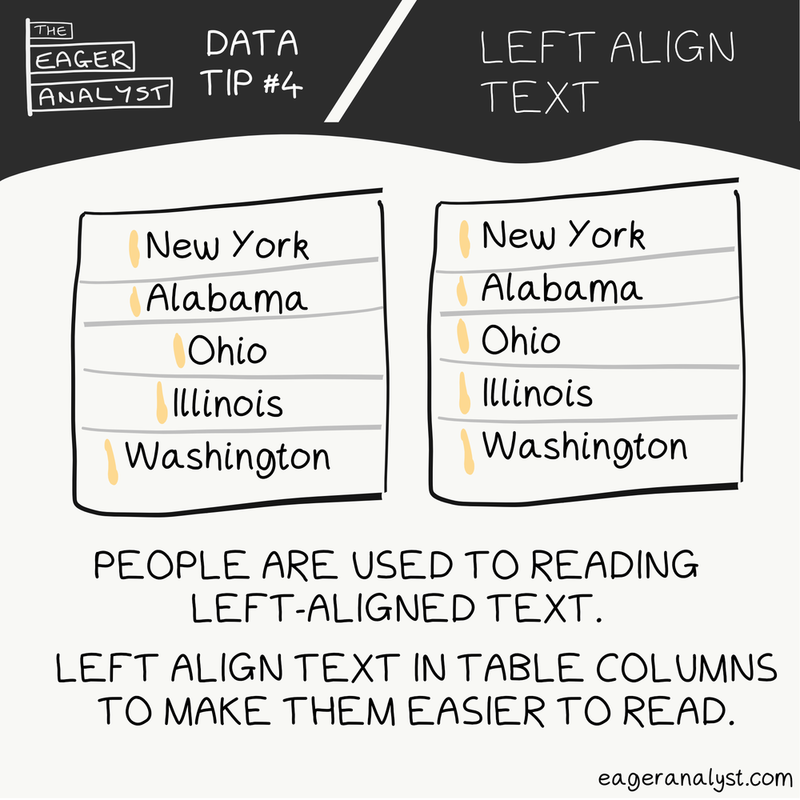 Left align text in table columns to make them easier to read. RIGHT ALIGN NUMBERS - It’s easier to tell the relative size of a number when the column is right aligned and the value precision is constant. Your mission is to drive analytics adoption in your company and you have a handful of dedicated people to do it with. It’s a start, but it’s modest and you’re going to need to demonstrate some successes before you’ll be able to grow. You’ll need to get buy-in from the business and deliver results, but also spend enough time on core analytics strategy that your successes build leverage over time. Hiring the right people for the job is fundamental, but how the analytics team is structured can be just as important in building a winning analytics function. When it comes to structuring a specialty function, everyone will have their own idea how to do it and each company's own unique culture, size, and goals will drive the most appropriate approach. I wanted to share some of my thoughts on what it’s like to work in a team that follows one of the three most commonly talked about models: the centralized model, the decentralized model, and the hub and spoke model. In this model, there is a single team that manages analytics requests for the department and they internally disseminate that request to the team members best equipped to handle them. This tends to work well where the team is offshore and is common where there is little integration between the department and the analytics team. The analytics team works more closely together and it's easier to perform knowledge sharing sessions and share resources. Analytics managers can determine the workload of the team and split time between supporting the business and investing in more foundational initiatives. The downside of this approach is that it is often hard for the analytics team to really understand the businesses they support and to identify new analytics use cases. As such, teams are more likely to end up working on lower value propositions and pieces of work that the business is less passionate about completing themselves. The business often sees this type of team as an outsourced resource and to compensate, management may put in place bureaucratic processes to request analytics resource. This will undoubtedly define the relationship that the team has with its stakeholders. In the fully decentralized model, the analytics team members sit with the business teams rather than in the analytics team itself. They form part of the business teams and work on their projects and priorities. You will need to have enough analytics team members to distribute to the different businesses. You will need team members who are clear on their role in the team and the support of business management to ensure that team members continue to focus on value-adding analytics problems. I've seen a number of cases where, over time, members of the analytics team find themselves either roped into other team initiatives or performing questionable 'analytics' work because the rest of the team don't want to do it. As a result, the valuable analytics work that could be achieved grinds to a halt. It can be hard to allocate resources to more foundational initiatives that would benefit multiple teams but are not directly tied to a particular business, for instance providing a database environment for analytics. It can be harder to form a cohesive analytics strategy and to leverage shared experience to solve analytics problems faster. In this setup, frequent knowledge sharing sessions and shared resources are important to make sure that the team continues to build on each other's successes. The hub and spoke model combines the previous approaches by having one centralized team that focuses on core analytics priorities while also having a team that is aligned to each of the business areas supported. The two teams can have divergent skill sets to help best accomplish their own goals. I’ve found that the core team is most effective when it houses a developer skillset with a few data scientists thrown in, while the business aligned teams work well with a balance of analytics and business background. The Central team is able to focus on Core analytics priorities that would benefit multiple teams but are not directly tied to a particular business, for instance providing a database environment for analytics. You will still need team members who are clear on their role in the team and the support of business management to ensure that team members continue to focus on value-adding analytics problems and not other business initiatives. Getting the most out of your data analytics team will be a different challenge in each organization and the short and longer term objectives of the team will be key in determining how best to structure things. As always, I’d love to hear your thoughts and the experiences you’ve had structuring analytics teams. Have you opted for a different model altogether? What made you choose a particular structure for your team? What decisions were key in getting you there? Here are some of the data-related posts I loved this month. Citymapper's GoBot tackles MTA announcements - New York's Metropolitan Transit Area (MTA) announcements are so difficult to understand that Citymapper have written a bot to decipher their meaning and capture them into their app. Introducing spaCy - If you're solving NLP problems, you should know about SpaCy. Visualizing supermarket checkouts - The author thought they’d stumbled onto a facinating insight until they realized the data wasn’t quite what they thought. Beautiful visuals despite the flawed analysis. So you've built a new data product, congratulations! Before you move on to the next challenge, you still have lots of work to do if it's going to have a real impact in your organization. Hopefully your stakeholders have been closely involved in the development process, but even if they have, the rest of the business needs to know about your product and how it can make their lives better. If your target users don't know your product exists then they are never going to use it. If you haven't already got one, you need a marketing plan. I've struggled with exactly the same problem many times before with a number of great solutions ending up left on the shelf due to a lack of awareness and promotion. In this article I wanted to share some of my insights into marketing a data product internally - how to make it discoverable, desirable and accessible. Making your product discoverable is all about making it easy to find. Think about how you would find your data product if you didn't already know it existed but also if you forgot where it was located. This applies equally to products that have an end user focus as well as products targeted at other technologists. Many companies have an intranet search feature or a search feature within their division or business line. If you have something similar, can you find your product from there? If it's not listed or is listed low in the results, how can you boost it up the list? If you have a catalog or inventory of data products, make sure that your data product is listed and that the listing is well thought out and up to date. A catalog of services is an easy way to showcase all of the products that are available in the organization and many organizations will have different catalogs for different audiences, make sure you're listed in the ones that matter most to your target users. While you might send out announcement memos to introduce your product people often forget or miss these, and over time new people will join the organization or move into the teams you're targeting and may not have received an initial communication. In your catalog listing, documentation and announcement memo, start with the key benefits your product offers. What pain point or user problem will be solved by your new product. Remember that features are not the same as benefits and that user benefits may be tangential to the key business drivers for implementing your product. Take time to think about who you're selling the product to and how they will benefit from it. A feature is what something is or does, a benefit is what users can accomplish with it. If your product has a user interface or visual component, show screenshots. Visual aids help to engage the end user and break up the text so that its easier to digest. If your product does not have a user interface and is designed to be accessed programmatically, include simple examples of how to use the product or API early on to build some engagement. Lastly, it should be clear how to access your product and those that are meant to have access are ready to go. If the product is marketed to a targeted team or audience, can you entitle them to the product before launch? If the product carries internally public data, can you entitle everyone to access? If users must register or request entitlement, is it clear on the landing page how to get access to the product? Is there a procedure to follow and is it sufficiently detailed to make it easy to complete? The more difficult it is to gain access to the product, the less likely the end user will persevere. Every organization is different and your marketing strategy will inevitably shift to match but getting your product out there is what's most important. Take time to plan your marketing strategy and be sure to invest time and energy into getting it right - building the product is just the start. I hope you find the recommendations I covered above useful and would love to hear some of your own suggestions too. As always, I’d love to hear your thoughts and the experiences you’ve had getting new products and services in front of users. What techniques have you found most effective? All views expressed are my own and may not reflect those of my current or prior employers.